Ian Thompson, chief credit officer at Standard & Poor’s Ratings Services, discusses the issues to watch for in Asia-Pacific in 2012. Global risks have steadily increased over the past year, with economic growth marked down. Brittle market confidence is manifesting in liquidity and funding pressures, particularly in the eurozone, with a knock-on effect on the rest of the world. While emerging markets are holding up, Standard & Poor's base case is for weak growth in the US and a mild recession in the eurozone during the first half of 2012. We expect economic growth fundamentals and government fiscal positions to remain generally sound in Asia-Pacific. However, the slowdown in the global economy and China is likely to continue to weaken export-dependent companies. Export growth is likely to weaken in early 2012, although the region should remain cost-competitive, notwithstanding some pressures such as wage growth in markets such as China, Vietnam and Thailand. Domestic demand and intraregional trade are holding up and inflationary pressures are easing, given lower commodity prices than a year ago. We therefore expect monetary tightening to reverse, as is already the case in Australia, China and Indonesia. Eurozone instability: Surges in capital inflows and rapid reversals are likely as investors vacillate between higher returns and increased safety. Soaring capital flows may reignite inflationary pressures, distort currency values and create asset bubbles. China's growth: While we expect China's growth to moderate to a sustainable 8% in 2012, a hard landing in China would have a significant impact on the region's growth outlook. The resilience of domestic demand amid weakening exports will be critical. Export softening: Exports could fall sharply as demand in the developed markets remains constrained. The risks are higher for Korea, Taiwan and Singapore. Mounting challenges across the globe could severely test the resilience of sovereigns in Asia-Pacific. The uncertainty over sovereign debt and banking sector stability in the eurozone is by far the biggest of these challenges. Unless policy actions help to stabilize sentiment, the confidence crisis in Europe could significantly affect Asia-Pacific sovereigns through tighter funding conditions, persistent risk aversion, volatile capital flows, or a credit freeze. A recession in Europe and slower growth in the US would lower demand for exports from Asia-Pacific. Of the 22 sovereigns that we rate in Asia-Pacific, 16 have stable outlooks on their ratings. Indonesia, Mongolia, the Philippines and Sri Lanka have a positive outlook, and only two sovereign ratings are on negative outlooks: Japan and Vietnam. The ratings on a number of highly indebted sovereigns and sovereigns that are vulnerable to weaker external funding conditions will come under pressure if the extreme eurozone-related risks materialize. Governments in export-driven economies would have to provide more fiscal and monetary stimulus to support growth and employment, and avoid social tensions. Such an impetus may prompt a surge in capital inflows, fuelling inflationary pressures. But a balancing act may be challenging. Additionally, some governments in the region are yet to address the longer-term issues of aging populations, rebalancing growth and broader financial reforms. The speed and effectiveness with which the European debt crisis is alleviated will determine the 2012 outlook for banking systems in Asia-Pacific. The region's banks generally have little direct exposure (largely short-term trade finance) to the eurozone. However, European banks have been reducing their significant exposure in parts of Asia-Pacific. Consequently, the indirect impact of a dislocation in global funding markets and an economic slowdown in Europe could negatively affect these banks. The region's strong economic performance over the past few years has been the biggest supporting factor for the credit profile of Asia-Pacific banking systems. Economic performance has not only bolstered revenue growth but also underpinned asset quality. As eurozone weakness dampens global and regional growth, nonperforming loans and credit provisioning are likely to increase. This trend could be more pronounced in banking systems exposed to high inflation, such as those of India and Vietnam; and the recent high credit growth, such as in China and Hong Kong. In addition, banking sector earnings are likely to weaken to reflect a dip in business volumes associated with slower economic activity. Contagion from Europe could unleash more anxiety in the already jittery credit markets in Asia-Pacific. Banks and other lenders in the region are already paying more to insure their debt financing, as reflected in the widening credit default spreads. That said, most banking systems in the region have strong retail deposit bases, which provide a buffer against volatility in wholesale funding markets. A tightening of credit underwriting standards and lower lending among Asia-Pacific banks would challenge the region's corporate sector, given its high dependence on bank funding, including that from European banks. 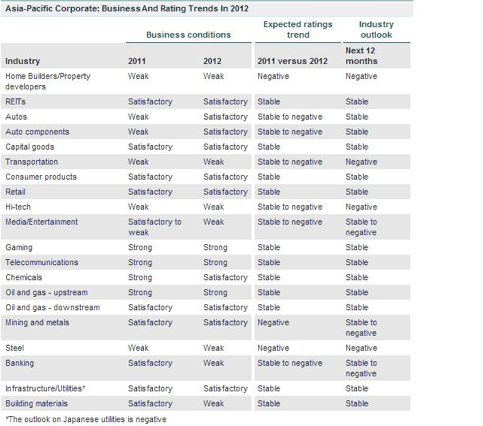 Our 2012 credit outlook for the Asia-Pacific corporate sector is generally stable with patches of weakness (see table 1). Economic growth prospects in the region are still resilient despite a softer US economic outlook and the uncertainty surrounding European sovereign risks. Asian economies are also showing signs of slowing down. Export growth in major export-oriented countries has been losing steam for the past few months. While a double-dip recession in developed economies is not our base-case scenario, it would have a deeper and more prolonged effect on Asia-Pacific economies compared with previous global crises. Exports and export-dependent industries in Korea, Japan, Taiwan and China would suffer heavily from such a recession. Our credit outlook for selected mining and metals, transportation, high technology and consumer electronic sectors in Asia-Pacific is negative in 2012. Our opinion is based on the weaker export outlook stemming from subdued global consumer demand, overcapacity in specific industries and high fuel prices. Our outlook on the Chinese real estate sector is also negative due to the Chinese government's initiatives to reduce economic growth to more sustainable levels and control asset bubbles in the property market in particular. The conditions for Chinese residential property developers are the toughest among Asia-Pacific real estate markets. Chinese companies continue to face liquidity risks and weak sales prospects. The smaller players are likely to be vulnerable in the next six to 12 months due to their limited financial flexibility, small scale and project concentration. China's (managed) economic slowdown at a time when the global economy is in the doldrums is contributing to negative pricing trends for steel, nickel, aluminium and possibly coking coal. The steel industries in China, Korea, and Japan face the most difficulty as demand from end-use sectors in China weakens on the back of reduced government stimulus for infrastructure and a weakening real estate construction market. Steel producers are therefore likely to realize lower capacity utilization and cut prices. The ratings on steel producers have little cushion for weaker cash flow coverage. We believe that major investment-grade-rated companies should be able to cope with the more challenging year ahead, and be better placed to take advantage of accelerating consolidation. Companies operating in China may continue to face rising wages and higher interest rates. These factors could constrain profit growth compared with the past few years. Notwithstanding the effects of a slowdown in the US and Europe, we expect Asia-Pacific's public and private infrastructure sector to continue to expand in 2012. Strong demand, broad-based economic activity, significant ongoing capital expenditure requirements and favourable demographics should continue to fuel growth in several sectors. These include power, transportation and social infrastructure. We anticipate that companies will use bank debt as a primary source of funding. We also expect companies to raise debt via bonds and hybrid issuances when opportunities arise. Several utilities in Asia-Pacific issued hybrid instruments for the first time in 2011, and we expect this channel to be important from a credit perspective and to provide the structural benefits of not diluting equity. Long-term funding will continue to lag long-term demand for infrastructure investment in the region. Most of the infrastructure and utility companies we rate in the region, barring the utilities sector in Japan, will remain stable in 2012. Nevertheless, the uncertainty of a prolonged global slowdown and its impact on GDP rates across Asia-Pacific could pose credit risks for some companies. Some economies in the region, such as Singapore, Thailand and the Philippines, rely heavily on export-driven income, and any slowdown in global growth may affect their economic growth. But there will be less impact on countries that have sizable domestic economies, such as India, China and Indonesia.